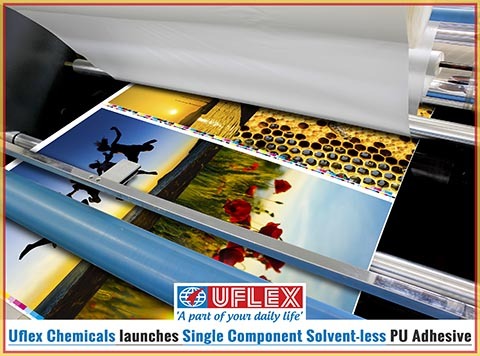 Noida (India) – Chemicals Business of India’s largest fully integrated multinational flexible packaging materials and solution company, Uflex Limited has launched a general performance, single component solvent-less PU adhesive - FLEXBON OC512. Setting sight on newer geographies within the domestic market, this new addition will help Uflex gain toe-hold in the offset mono-carton industry. This product enjoys a strong demand across the Indian Market. This moisture curing adhesive is designed for laminating film with printed and un-printed board or paper, with an average coating weight of 3 to 5 GSM (depending upon the thickness of the board). Given the viscous nature of FLEXBON OC512 at room temperature, it is heated at 80 –100 degrees C and pumped through a dispenser. This adhesive works well on solvent-less laminating machines having smooth rollers. As demand for folding cartons remains encouragingly strong, this new product by Uflex will immensely benefit the FMCG industry. Besides myriad functional properties of Cartons, brand owners try making the most of the secondary packaging to effectively communicate with trade/channel partners through eloquently colourful designs and attractive messaging.